Are you interested in learning more about yoga? Do you want to make your career as a yoga teacher? If yoga excites you and if you want to dive further into the origins of yoga and the basics of yoga you need the right course that can help you get started. 200 hours hatha yoga course would be an ideal start for those who want to learn more about hatha yoga. The course usually is designed for beginners who have some experience and knowledge about yoga and have been practicing some form of yoga for few months or a year. This is a great way for someone who wants to open his mind and explore various postures and techniques used in hatha yoga. 200 hours hatha yoga teacher training is also ideal for those who want to pursue a career in yoga as an instructor or teacher. Understanding the basics of yoga is critical if you want to become a certified teacher. With the basic course, you can learn more about the asanas and alignment and adjustment. 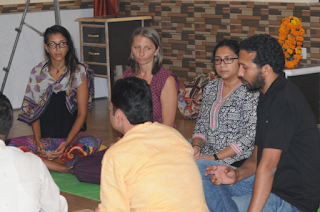 The course would also focus on various breathing techniques, pranayamas, shatkarmas, and mudras. 200-hour teacher training course also covers mantra chanting and anatomy and physiology of yoga which is important for beginners as they need to understand the origins of yoga and how it works on a physical and mental level. Kaivalya Yoga School provides 200 hours hatha yoga teacher training in Rishikesh, India for those who are interested in learning more about yoga and pursuing a career in yoga as a qualified and certified yoga practitioner.